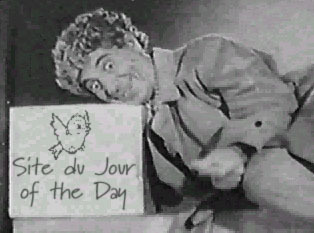 Welcome to the Site du Jour of the Day Archive for December 1998, companion site for the original e-mail version of Site du Jour of the Day. Episodes are sent out seven times a week to people around the world. One of the reasons Site du Jour of the Day was started grew out of the frustration of following pointers from others sites. All too often, what someone thinks of as being a site worth visiting turns out to be a silly waste of time  especially if there is only a pointer and no description. The same can be said for Site du Jour of the Day recommendations occasionally I'm sure. But as I see it, if a site is good enough to write about it can't be all that bad. Not every site profiled is one everyone will be interested in, it works out well that way. (981205) No cow's milk for me thanks! At one time or another almost every one of us has been lured in by the advertisements in comic books or teen magazines promising FREE PRIZES for selling seeds, greeting cards, etc. or offering exotic animals as pets (all absolutely FREE). The only thing you paid for was shipping and handling. There were the monsters, dolls, submarines and my personal favorite  the X-Ray Specs, which of course I never ordered. To this day I have yet to see a pair in real life. As the closing of the year draws near getting a jump on the next one is hardly a concern for most of us, yet the prospect of making life a little more comfortable is something we all strive for. Financial independence might be nice to try on for a while and although arriving at such a station in life is never easy, getting there can be less of a challenge if you know how. Investments and hard work can lead to financial security either by knowing who's stock to buy or which companies are better than others to work for. Even self-employment can become more profitable if you know what the market is and more importantly, what the competition is up to. Finding a single source or tool for such tasks can be a big job in and of itself, for many people it takes years of experience to gain the wisdom and knowledge necessary these days to succeed. For those individuals just getting started and even veterans in the field, Debbie Flanagan's Researching Companies Online site is an incredible collection of outside pointers and tutorials for developing even the most basic of all skills  knowing where to look and what to look for. Debbie Flanagan's tips and hints are well thought out and this, coupled with data from featured sites, helps to make Researching Companies Online far less intimidating than you would think. A very useful site and it's free too. Over eighty stories and legends with a Christmas theme have been rounded up and indexed on this page, a part of The Blackham Family Page (http://www.wipd.com/~blackham/). Pieces such as Babouscka, Billy Miske's Last Fight, Dickens' A Christmas Carol, The Gift of the Magi by O. Henry, Jello Christmas, Keeping Christmas by Henry Van Dyke, Frank A. Baum's A Kidnaped Santa Claus, The Littlest Angel, Olive the Other Reindeer by Micheal Christie, [Artaban] The Other Wise Man, The Pine Tree by Hans Christian Anderson, Thunder Oak, and the classic holiday jewel Yes Virginia, There is a Santa Claus can all be found. There has obviously been a lot of care put into these pages and it shows. At sundown tonight the Jewish holiday of Chanukah begins and Chanukah On the Net offers a lively exploration of the Festival of Lights. While there are several interpretations of the origin of this holiday, many traditions have survived and developed during the 2,300 years since the Maccabees triumphed over the Syrians in Israel. Visitors to this site can learn about this important conflict, light a candle on the virtual menorah, sing the Dreidel Song while spinning a dreidel or just enjoy the other activities and features. The RealAudio Stream of prayers and music by Cantor Pinchas Rabinovicz may be considered out of place by some but add a great deal to the site. The hottest toy this season is the Furby (http://www.game.com/furby/index.html), a cross between Gremlins from the movies and our old friend Teddy Ruxpin (see Vaughn Hangartner's Teddy Ruxpin Frequently Asked Questions and Information page (http://www.mindspring.com/~mathue/faq.html). Furby has been responsible for about a dozen assault charges being filed outside of the Meg-a-Lo Mart in the US since Thanksgiving Day. Shoppers spreading a little good cheer after missing the opportunity to buy from the limited supply of the toy made available by Tiger Electronics, LTD. have shown poor sportsmanship, but consider the source. Television news magazines have run packages shot using hidden cameras. People are successfully and legally selling Furby for hundreds of dollars  suggested retail is $30! One woman was shamed into admitting to having paid $250 each for three of the things when asked why she was offering them for $300 a pop, buyers remorse perhaps? You may not think you know who Clint Howard is, but you do. That was the argument once made on a trip to the Florida Keys after playing a game of Guess What I'm Thinking. Inspired by the fact that we were driving through the area where one of Clint Howard's first television shows was filmed, I couldn't help but think of him. The shows Gentle Ben and Howard-less Flipper both had segments shot at Port of the Everglades in Collier County, just outside of Naples, Florida. It was only natural at that point to introduce Ron Howard's little brother to my traveling companions. Clint Howard has starred in five series, made guest appearances in fifty television episodes, acted in eleven television movies and fifty-four feature films. Some of this work has stemmed from being Ron's brother to be sure, but guess who was the voice actor for Roo in Winnie the Pooh and the Blustery Day? Clint Howard even had a part in Walt Disney's The Jungle Book. If you still don't know who he is, visit The Clint Howard Project, a part of Andy Ihnatko's Colossal Waste Of Bandwidth (http://macworld.zdnet.com/andyi/departments.html) in the section called Andy Ihnatko's Fabulous Fridge of Cinema (http://macworld.zdnet.com/andyi/fridge.html). Not only has Andy Ihnatko assembled a fitting collection of photographs, but the Complete Clintography is there as well  a must see for Clint Howard fans everywhere. On Saturday, the United States House of Representatives (http://www.house.gov/) voted to impeach President Clinton. This issue is still a long way from being resolved, and the next stop is the United States Senate (http://www.senate.gov/). As the situation plays itself out public opinion polls are showing overwhelming support for the President. No matter what your view on the whole subject is, there is one important factor I feel strongly about  if you are part of the electorate and did not participate then your opinion does not matter either way. This Archive has been opened times since December 6, 1998.